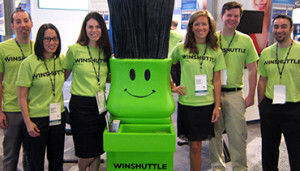 Visit the Winshuttle booth (#239) to see our latest developments including Winshuttle Composer. We’re here to show you how to become a Winshuttle hero so stop by with all your questions…our booth staff are friendly, knowledgeable and ready to help. Did you know that the average SAPPHIRE NOW attendee walks approximately 70 miles while at the conference? Make sure you take advantage of the complimentary massages in our booth so you can recharge your mind and body. See you soon!